The innovative Pluvis umbrella is both fashionable and safe. While an LED light at the tip (Pluvis® toplight) makes the user visible to other pedestrians and motorists, the umbrella's ferrule end also has an integrated LED torch which simultaneously lights up the pavement. This provides safety in the dark and rain and warns approaching drivers from all directions. 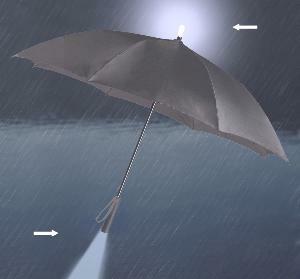 The umbrella illuminates at the touch of a button. A second touch makes the illumination flash on and off repeatedly. Supplied with an umbrella cover and in elegant packaging, the illuminated umbrella makes an excellent gift. Automatic opening mechanism. Soft-touch handle with fabric wrist strap. Supplied with three AAA batteries, which are easily fitted into a compartment within the handle. Canopy colour black. Overall length 85cm. Canopy diameter 108cm.